The Thirty Years' War, 1618-1648, was a horribly devastating war that engulfed Germany and all its neighbors in decades of fighting, rampaging and destruction. It was primarily a religious conflict as Catholic states sought to suppress Protestantism. It began in a fight between Bohemian Protestants and Hapsburg Catholics in 1618. It soon became a political conflict for power that included Spain, Holland, Denmark, France, Sweden, and The Habsburgs of the Holy Roman Empire. The war ended with the Treaty of Westphalia in 1648. The war began in 1618 with a revolt of Protestant Bohemia against the Catholic Habsburg Empire. After Bohemia's defeat in 1620, the war spread into western and southern Germany. In subsequent years, Spain (1621), Denmark (1626), Sweden (1630), and France (1635) became involved. Historians generally are not explicit on why the war began and then spread throughout Europe; they are mostly divided between those who believe it was a German war that was joined by other powers and those who believe it was an international war simply triggered by events in the Habsburg Empire. The Thirty Years War was a Central European war that came to involve so much of the continent because the Habsburg Empire was so extensive. Sweden's role in the Thirty Years War under King Gustavus Adolphus (1594 - 1632) determined the political as well as the religious balance of power in Europe. A notable military victory for Gustavus Adolphus was the battle of Breitenfeld (1631). With a superb military machine with good weapons, excellent training, and effective field artillery, all backed by a highly efficient government back home that paid the bills on time. Gustavus Adolphus was poised to make himself a major European leader, but he was killed in battle in 1632. 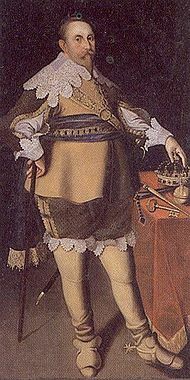 Axel Oxenstierna (1583-1654), leader of the nobles, took charge and continued the war in alliance with France. Steinberg, S. H. The 'Thirty Years War' and the Conflict for European Hegemony 1600-1660 (1966). This page was last modified on 9 April 2019, at 17:59.